Sep 6, 2018; Toronto, Ontario, CAN; Cleveland Indians second baseman Jason Kipnis (22) congratulates shortstop Francisco Lindor (12) on his solo homerun in the first inning against the Toronto Blue Jays at Rogers Centre. 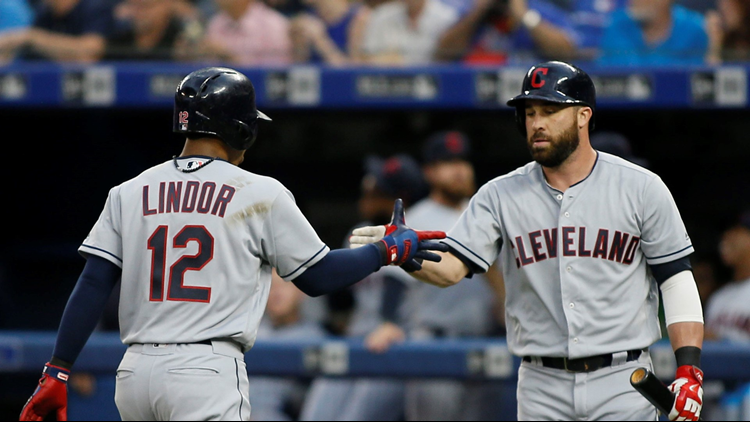 CLEVELAND — The Indians struggling offense received some good news on Monday. Veteran 2B Jason Kipnis has been activated off of the 10-day disabled list, while SS Francisco Lindor will begin a rehabilitation assignment starting on Tuesday. Injuries have plagued Kipnis since the start of Spring Training. He was limited to just 10 Cactus League games because of hip, quad, and calf injuries, then suffered a calf strain on March 20. Kipnis started a rehab assignment at AAA Columbus on April 5. The 32-year-old Kipnis is expected to make his season debut on Monday night in Seattle. The switch-hitting Lindor was making steady progress from a right calf injury when he rolled his ankle while caught in a rundown during a minor league scrimmage in Arizona. Lindor batted .277 last season with 38 home runs, 92 RBIs and 25 steals. He will rehab at AAA Columbus. Without Kipnis and Lindor, the Indians' offense has sputtered out of the gate. The Tribe has scored a total of 52 runs in their first 15 games and are hitting just .194 as a team, the worst average in all of baseball. To make room on the roster for Kipnis, the Indians designated infielder Brad Miller for assignment. Miller hit .250 in 13 games for the Tribe.